The Puffstalk (ボケエリンギ?, lit. : "Stupid King Trumpet Mushroom") is an enemy found in Hey! Pikmin. It is a smaller relative to the Puffstool that dwells within holes in walls. The Puffstalk is a docile creature that can be found within holes in walls. It has no attacks, and its own means of defense is to disappear and reappear between various nearby holes. Mushroom Valley: In this area, its den contains three holes. When it is defeated, it drops the Constitution Gate. Burning Bog: It now dwells within four holes. When defeated, it drops the Tangerine Paste. The Puffstalk is quick, but it only has so many holes it can pop out of. It is fairly predictable in its patterns, and can be taken out by simply hitting it with Pikmin whenever it reveals itself. The first Puffstalk's den, in the Mushroom Valley. The second den, in the Burning Bog. 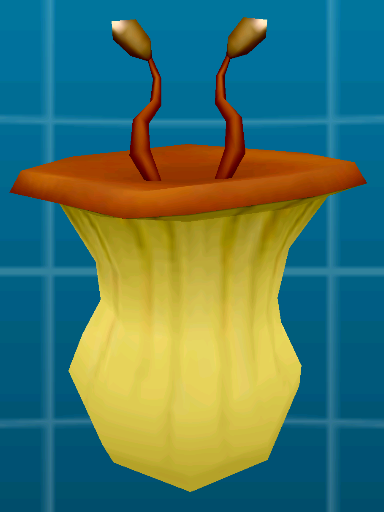 The Puffstalk is the first member of the Sporovid family to appear in a Pikmin game in 16 years. Puffstalks actually have small stubby legs. This is only easy to see in the Creature Log. This page was last edited on February 14, 2019, at 22:34.